ALI AHMED KARTI, Minister for Foreign Affairs of Sudan, said his country was approaching the international community with new momentum, choosing peace and stability despite sacrificing a dear part of its land. Sudan had chosen peace and displayed patience amid obstacles to its implementation, accepting the result of South Sudan’s referendum for independence and welcoming it into the community of nations. However, that did not mean a “final divorce” in an era of globalization and alliances that transcended political boundaries. Sudan was committed to settling all the problems related to its peace agreement with South Sudan, in particular border issues and oil revenue. It would deal with all tensions and had accepted the choice of separation, not because it did not want unity, but because it wanted sustainable peace and stability. The Doha Document for Peace in Darfur had been accepted and signed because it responded to all the aspirations of the people of Darfur, he said. That text had been considerably supported by the people of the international community, and he reiterated thanks to all regional and international partners who had contributed to the agreement’s conclusion. 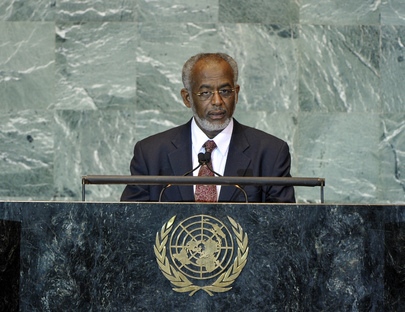 Sudan would continue to implement the five pillars of the strategy for political settlement of the Darfur dispute, giving priority to refugee resettlement. He said he had expected the Secretary-General, in his speech to the General Assembly, to give a special paragraph about Sudan’s commitment to peace, and called on international organizations not to be hoodwinked by some countries that refused to pay their dues. The leadership of President Omer al-Bashir had brought peace and deserved respect, and not the levelling of accusations promoted by the International Criminal Court. President al-Bashir was the legitimate leader, elected freely and fairly. Unilateral economic sanctions adopted by the United States were unjust measures against the people of Sudan while the country moved in a more open manner and was determined to play an active role as a member of the international family. The international financial crisis had increased poverty in developing countries, dropping social services at a time when climate change exacerbated problems in those countries, he said. Increased aid for famine in the sister republics in Africa, notably Somalia, was a priority. The African Union and early warning systems had also helped maintain peace and security. African efforts for peacemaking, such as the Council of Wise Men, led by former South African President Thabo Mbeki, played a key role in settling disputes. But reform of the Organization, notably the Security Council, was still required. Real reform of the Council would stop it from being exploited in a way that casts doubt on the Organization’s credibility.